Caves are underground Karstic features. As water flows underground, the joints are widened so much that caves form up. Water seeps through the limestone joints above the cave, carrying dissolved calcium carbonate with it. As it drips from the ceiling of the cave, some of the carbon dioxide escapes and the water is unable to hold all the calcium carbonate. this is left on the ceiling or wall. As the drop of water falls to the floor more calcium carbonate is deposited. These deposits are known as dripstone - the best known are STALACTITES (which hang down from the roof), and STALAGMITES (which grow up from the floor), and PILLARS (which go from the floor to the roof). These form when the lime-charged water evaporates and leaves behind the solidified crystalline calcium carbonate. Although much water in limestone passes through rock joints and flows underground there may be some streams on the surface. These may occur where the flow of water is too great for the size of joints. Some streams use their former surface bed as an overflow channel in times of heavy rainfall. Flat topped plateaus and deep gorges are common in limestone areas. As there are few surface streams horizontal limestone strata tend to be worn down evenly by weathering. When rivers do flow down across limestone they of ten cut vertically into the rock by solution. 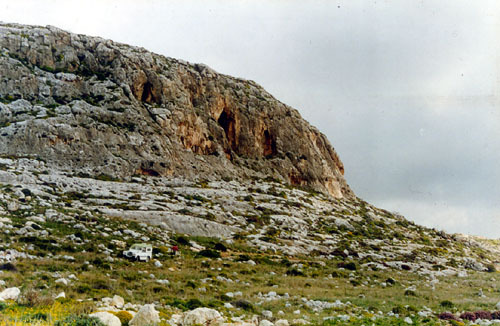 Examples of caves found in Malta are Ghar Hasan, Ghar Dalam and Ghar il-farfett. A fragment of a stalagmite.